8.50pm: There is also dense and freezing fog in other parts of the east and in the midlands. 8.45pm: AA Roadwatch says icy conditions and freezing fog are still causing problems around Dublin. It says the heaviest fog is to the west of the city and it is advising motorists to use fog lights in affected areas. 8.37pm: Met Éireann says it will be dry, calm and exceptionally cold tonight with a widespread very severe frost and freezing fog. It says lowest air temperatures will be -4 to -12C. It also says some snow showers will affect the east coast around daybreak. 7:46pm: The deadline for receipt of declaration forms from parents for the The Early Childhood Care & Education Scheme has been extended for one week (Wednesday, 13 January) due to weather conditions. 7:22pm: Bus Éireann has said it will endeavour to operate as many services as possible in the east of the country this evening. 6:31pm: Carlow County Council has said Army personnel at Stephens' Barracks in Kilkenny are on standby to assist them with transportation as weather conditions look likely to worsen. 6:30pm: Clare County Council has confirmed it is making supplies of quarry grit available to communities across the county. 5:55pm: All IT Tallaght exams schedule for Monday in the National Basketball Centre, the Institute and other centres have been postponed. A revised timetable will be posted on the Institute website. Exams for the rest of the week will proceed as scheduled. 5:27pm: Waterways Ireland has advised people to take extreme care in locations along canals, lakes and rivers in the current weather conditions. 5:17pm: The Insurance Institute of Ireland has postponed all tuition sessions due to take place in UCD tomorrow, 9 January. Tuition sessions in Cork and Galway will run as normal. 4.58pm: All Dublin Bus services operating with some routes curtailed but all Nightlink services have been cancelled tonight and tomorrow night. 4:50pm: Minister for Education Batt O'Keeffe has ordered that the country's 4000 national and secondary schools are to remain closed on Monday, Tuesday and Wednesday of next week. 4.49: The unloading of 4,000 tonnes of rock salt began this afternoon by the Shannon Foynes Port company at Foynes port in West Limerick. 4.23pm: Muintir na Tíre Volunteers has set up a hotline from 10am to 8pm daily until the end of the cold snap to provide support to communities nationally. Phone: 086 6000751. 4:18pm: Any older person who does not have regular visitors and is running out of food, fuel or medicine should contact the Society of St Vincent de Paul at 01-8386990 or Age Action at 01-4756989. Both lines operate 9am to 5pm, Monday to Friday. The Age Action line will also be manned tomorrow (Saturday) from 9am to 6pm. 4:13pm: Dún Laoghaire-Rathdown County Council has 23 Council crews deployed across the county dealing with roads and footpaths. 3:59pm: The National Roads Authority has said the situation of salt supplies for gritting roads is critical. According to the NRA, about 20,000 tonnes of rock salt is required each week. So far they are only confident of securing 11,000 for next week. 3:55pm: Cork City Council repair crews are working to deal with around 100 burst water mains in the city. 3:51pm: The charity ALONE is calling people to be mindful of their older neighbours, family and friends who live alone, and to ensure that they visit them regularly during this cold snap. 3:50pm: Leitrim County Council says the Army will be deployed from tomorrow (Saturday) to grit foothpaths initially and then assist with gritting in rural areas. 3:33pm: Water supplies in South Dublin County Council are at a very low level due to the increased demand on the water network during this extended cold spell of weather. As a result the Council has had to implement pressure control measures resulting in reduced water pressure to Lucan, Clondalkin, Palmerstown, Tallaght, Templeogue, Walkinstown, Terenure and Ballymount areas. This regime will be in place until water supply level returns to normal. 3:26pm: Limerick County Council says some properties are experiencing low water pressure or in some cases full interruption to supply. People should check for burst pipes and to try and conserve water as much as possible. 3:12pm: NUI Maynooth said it had a normal turnout for their winter exams which got underway this morning. A spokeswoman said 94% of students turned up, which would be normal for this time of year. 3:10pm: The Dublin Institute of Technology has postponed all exams due to take place on Monday because of the bad weather. The rest of the exam schedule is due to proceed as planned but the college will review the timetable on Monday. The postponed exams will be rescheduled at the end of current exam sequence. 3.08pm: The Irish Primary Principal's Network says it believes the number of school closures next week exceed the number this week if there is no thaw. 2.55pm: The Society of St Vincent de Paul and Age Action have teamed up to help older people who may be experiencing serious difficulties as a result of the prolonged cold weather. 2.54pm: Iarnród Éireann has advised customers that all rail services are continuing to operate on all routes, and the company will be maximizing the capacity of rail services. 2.53pm: Another very cold and frosty night forecast in Carlow. Lowest air temperatures could be down to -9 with road temperatures falling as low as -12. 2.24pm: Munster's match against the Llanelli Scarlets on Sunday - just about the only major sporting action still standing this weekend - is expected to go ahead. Get the latest on sporting cancellations, postponements and re-scheduled fixures here. 2:20pm: The Government's Emergency Co-ordinating Committee is meeting in central Dublin and getting updates from Met Éireann on the latest forecasts. The meeting is being chaired by the new director Sean Hogan. Environment Minister John Gormley is also in attendance. 2.15pm: Another spell of snow will affect mainly Leinster and Munster during Sunday and Monday with falls of 5cm to 10cm expected. 2.02pm Gardaí in Tramore in Waterford are warning people against walking on the lakes on the golf course in the town which have frozen. The water in these lakes is deep and highly dangerous. 1.48pm Workers at Foynes have begun handling a 4,000 tonne salt cargo on board the MV Jumbo. 1.40pm Lt Caitríona Nic Cába, platoon commander of the Defence Forces troops in Co Kildare, said the army was gritting and salting roads in Newbridge, Maynooth and Clane. 1.21pm Dublin City Council says water production is at its peak, but demand is outstripping supply. It says water restrictions will have to be introduced. 1.19pm Eircom said service disruption has been caused to its network. Just over 8,000 faults have already been cleared this week alone. 1.15pm Every snowfall has a silver lining…. Dublin Cllr Nial Ring says that the cold spell has brought out the best in community spirit. 1.12pm Wexford County Council has given the go-ahead to farmers to grit icy secondary roads, prompting local TD Michael D'Arcy to call on other local authorities to follow suit. 1.10pm 130 pairs of wellies were purchased at BT's Grafton St store yesterday by those bravely navigating the icy footpaths of the capital. 12.58pm Irish Rural Link - the national network campaigning for rural communities - has called for a national helpline number to coordinate all urgent requests from members of the public who need assistance. 12.35pm Fingal Co Council in Dublin has again appealed to residents not to leave taps running as water levels in some reservoirs are critically low. 12.33pm Gardaí in Tramore, Co Waterford, are warning people to stay off the lake beside the amusements in the town which has frozen. 12.25pm Following an inspection of the RDS this morning, tonight's Magners League fixture between Leinster and the Glasgow Warriors has been postponed due to extreme and unprecedented conditions overnight and this morning. 12.24pm Water collection points have been set up at various points around Limerick City today for anyone whose supply has been affected by the freezing weather. 12pm Motorists are advised to continue to drive with extreme care as further snowfalls are also expected over the weekend. 11.57am Met Éireann has said it will be extremely cold for the rest of today with frost, ice and freezing fog lingering in some parts. Enniscorthy: Assisting District Nurse reaching isolated patients. Galway: Assisting Palliative Care Nurse reaching isolated patients. 11.40am Carlow County Council is about to formally contact the defence forces in Kilkenny to get help with transportation. 11.28am Bord Gáis has said that it will provide €1m towards the gas bills of those most in need as a result of the prolonged cold weather. Organisations that assist its vulnerable customers, will receive these funds to ensure that those most in need get additional support. 11.22am If you must venture out today, be sure to wrap up warm just as RTÉ's Paul Cunningham and Mary Calpin did last night. 11.14am Driving conditions in Kilkenny city are improving slightly but gardaí are still advising caution on all routes. 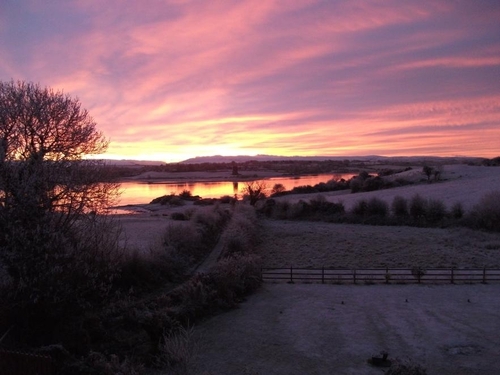 Temperatures this morning in Kilkenny city were -12C. 11.10am The cold weather has led to a 20% increase in demand in all Clare County Council's water supplies. Most of the council's water treatment plants are at or near production capacity and water is rationed in some areas. 11.05am Kerry County Council has two days supply of rock salt but are expecting a delivery later today from Foynes and on Monday from Ringaskiddy. 10.45am The shipment of 4,000 tonnes of salt due to be unloaded at Limerick city docks today will now be unloaded at Foynes port on the Shannon estuary. 10.35am Cork County Council's levels of rock salt have been described as critical and they are concerned about Sunday's weather forecast for snow. 10.25am The Irish Red Cross has published a list of practical tips on its website to help people cope with accidents and illnesses brought on by the extreme weather. 10.15am Parts of Cork City saw snow for the first time since the cold spell began three weeks. The Lough - its well known inner city lake - remains frozen over and gardaí have once again appealed to people not to walk on it. 10.10am Get a list of contacts that may be useful during the severe weather. 10.05am A shipment of 4,000 tonnes of salt into Limerick city docks, which was to be used by local authorities along the west coast, has been delayed by the freezing weather. Heavy fog on the Shannon estuary last night and this morning delayed the shipment. Efforts are under way to see if it can be unloaded at Foynes further down the estuary or at the docks in Limerick city over the coming days. 9.50am Get a list of school closures. 9.35am Dublin, Cork and Shannon airports experiencing slight delays. While, as yet, no departing flights have been cancelled, most are experiencing delays, some by up to half an hour. Flights due to arrive in Dublin this morning from Galway and London were cancelled.